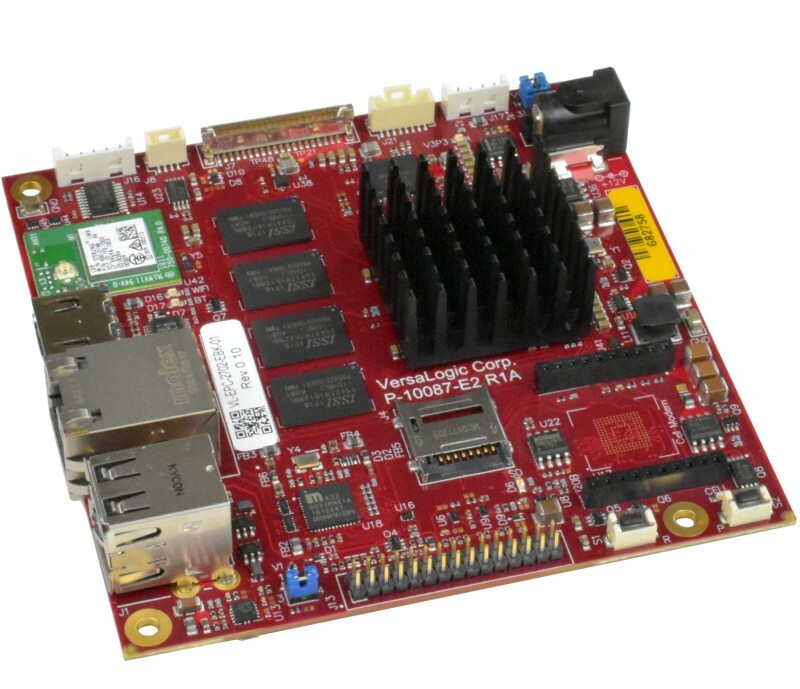 VersaLogic has announced the Swordtail SBC that features models with either the NXP i.MX6 Quad (quad core), or the i.MX6 DualLite (dual core) processors. The SBC includes on-board Wi-Fi, Bluetooth and a cellular plug-in socket. At home in hostile environments the compact 95 mm x 95 mm computer board is rated for operation at full industrial temperature range (-40° to +85°C). Unlike many Arm-based “modules”, VersaLogic’s new Arm-based products are complete board-level computers. They do not require additional carrier cards, companion boards, connector break-out boards, or other add-ons to function. Swordtail boards have been designed to enable transmission of maintenance or diagnostic information without the need for a wired connection. Wi-Fi and Bluetooth radios are included on board, and a NimbleLink Skywire socket supports a wide range of optional cellular and other wireless plug-ins. The Swordtail embedded computer board is suited for deployment into demanding industrial, smart city and transportation applications requiring rugged, long-life, power efficient and industrial temperature rated solutions. Both Swordtail models feature soldered-on memory, and a variety of I/O connections. In addition to wireless capability, the on-board I/O includes a Gbit Ethernet port with network boot capability, two USB 2.0 Ports, serial I/O (RS-232), CAN Bus, microSD socket, and I2C interface. The boards can accommodate up to 32 GB of on-board flash storage. Designed for COTS and MCOTS users, Swordtail can be modified for specific applications in quantities as low as 100 pieces. Many applications that require lower power or lower heat dissipation also need very high levels of reliability. Designed and tested for industrial temperature (-40° to +85°C) operation, VersaLogic’s Swordtail also meets MIL-STD-202H specifications to withstand high impact and vibration. Carefully engineered and validated, Swordtail excels in unforgiving environments. Like other VersaLogic products, the Swordtail is designed for long-term availability (10+ year typical production lifecycle). The Swordtail single board computers (EPC-2702), will be available Q2 2019 from both VersaLogic and Digi-Key. OEM pricing starts at $236. 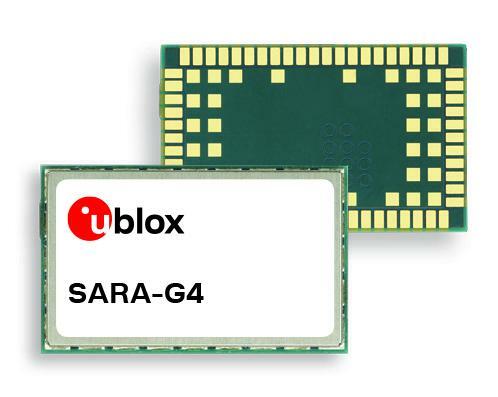 U‑blox has announced the SARA‑G450, a cost‑optimized 2G cellular module for machine‑to‑machine (M2M) applications, such as utility metering and tracking systems. 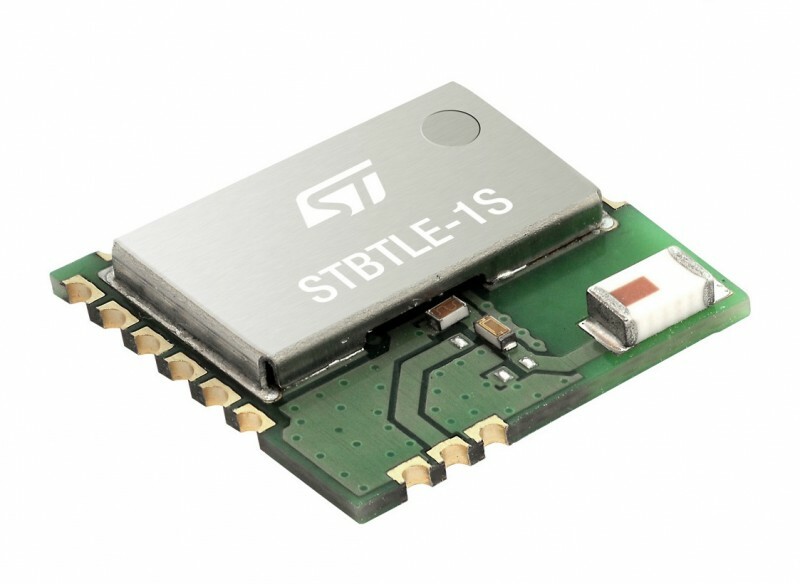 Provided in the industry‑proven SARA form factor, the SARA‑G450 quad‑band GSM/GPRS module lets product developers easily migrate their products to 3G, LTE, or LPWA technology to meet a broad range of environmental and technological requirements. 2G cellular technology offers reliable performance for mobile applications and broad geographical coverage. Until recently, this made it the technology of choice for machine type connectivity such as fleet management, metering and tracking. While some regions are currently phasing out their 2G network infrastructure (most notably the USA), 2G continues to be a viable and popular option for M2M solutions in regions still lacking NB‑IoT and LTE Cat M1 networks or where coverage is spotty. The SARA‑G450 is an ideal solution for cost and space‑sensitive applications in these markets. Thanks to its pin‑compatibility with the entire u‑blox cellular line‑up product designers can use a single platform and PCB design to enable solutions for a variety of air interface technologies, including 2G, 3G, LPWA (LTE Cat M1 and NB1), and high speed LTE. This also means that product developers can anticipate future upgrades of their applications to move to LTE Cat M1 and NB1 connectivity as soon as they become available in their target markets. SARA‑G450 is a standard grade quad‑band GSM/GPRS module that is power‑optimized for IoT applications. It offers the flexibility to combine with a variety of best‑in‑class u‑blox GNSS or Bluetooth modules for solutions that integrate positioning, short range and cellular communication. An embedded internet suite facilitates the development of a wide range of M2M devices. Digi International has announced the availability of the Digi XBee3 Cellular LTE-M development kits, featuring Digi’s next-generation smart cellular modem. This LTE-M certification, to be followed by the certification of Digi XBee3 Cellular NB-IoT in October 2018, allows Digi to claim having one of the first LPWA, software-defined technology-agile modems capable of offering Cat-M or NB-IoT on a single, compact footprint. Designed to be configurable, developers can easily standardize and future-proof their IoT designs by simply changing modems and SIMs to leverage different wireless protocols without having to redesign hardware for different regions or applications. The new Digi XBee3 Cellular LTE-M smart modem is integrated into the development kit via a 20-pin Digi XBee socket, ultimately allowing for solution connectivity via millions of sockets already deployed around the globe. The module can also be easily configured and controlled from a centralized platform such as the Digi Remote Manager..
Digi International is an AWS Advanced Technology Partner in the AWS Partner Network (APN), and the Digi XBee3 Cellular LTE-M is a smart cellular modem supported by AWS IoT Core. With built-in Digi TrustFence security, the module’s identity and data privacy features use more than 175 controls to protect against new and evolving cyber threats. It also provides the tools to secure connected devices, including data in motion with TLS 1.2 encryption and bi-directional authentication, required for AWS IoT connectivity. 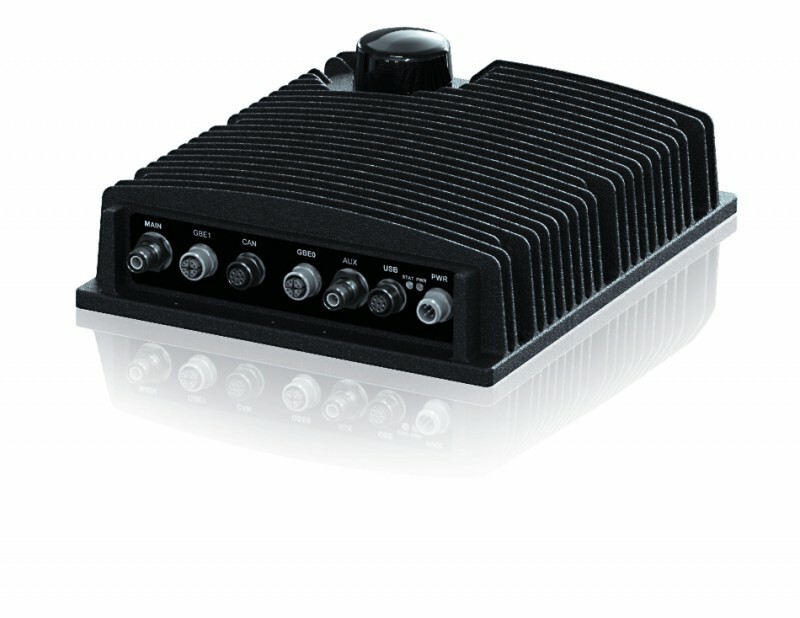 Kontron has introduced the EvoTRAC G103 In-Vehicle Rugged Cellular and Wi-Fi Gateway that provides broad connectivity capabilities that enable a new range of in-vehicle management, remote access and cloud-based applications. Providing the mobile connectivity and onboard recording device storage needed for a new generation of more intelligent systems, the EvoTRAC G103 features a WiFi and 4G Advanced Pro+ LTE module, and includes 64 GB eMMC for onboard storage as well as optionalfixed storage capacity. The EvoTRAC G103 is a flexible open-architecture building block platform that supports fast access to actionable information from its integrated dual Gigabit Ethernet and dual CAN bus interface that supports 2.0 A and B, along with two USB 2.0 interface. With the explosion of data generated by today’s commercial vehicles, implementing a robust gateway such as the EvoTRAC G103 offloads important information operators can use to keep drivers safe, lower fuel consumption and effectively manage maintenance costs. 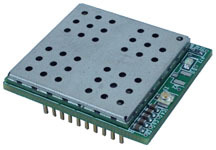 Tested to survive extreme temperature (-40° C to +80° C) and other demanding on and off-road vehicle conditions (shock, vibration, humidity, salt fog), the EvoTRAC™ G103 Gateway leverages Kontron’s hardened Type 6 COMe E3845 COM Express® CPU module coupled with a ruggedized Carrier Board, all packaged in a natural convection, sealed IP67 enclosure. Extremely rugged and mechanically compact, this gateway is based on the efficient, low-power Intel Atom processor, and incorporates protection from water and dust ingress, as well as CISPR25 emissions and ISO 11452-2 susceptibility. One of the critical enabling technologies making the Internet-of-Things possible is the set of well-established wireless standards that allow movement of data to and from low-power edge devices. These standards are being implemented in a variety of chip- and module-based solutions. Connecting the various nodes of an IoT implementation can involve a number of wired and wireless network technologies. It’s rare that an IoT system can be completely hardwired end to end. That means most IoT systems of any large scale depend on a variety of wireless technologies including everything from device-level technologies to Wi-Fi to cellular networking. 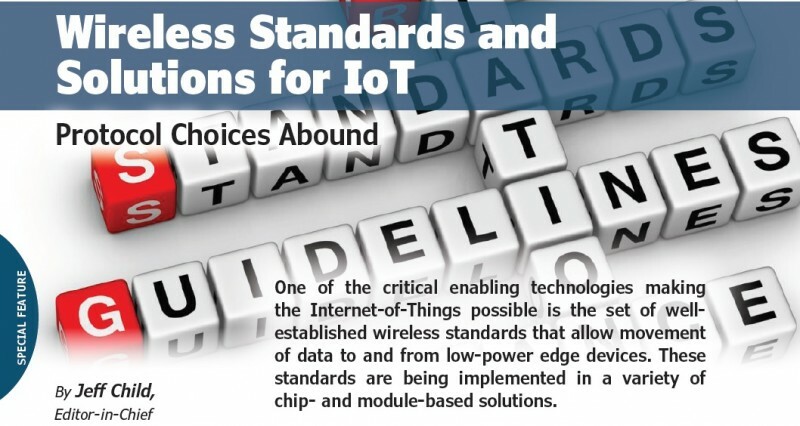 IoT system developers have a rich set of wireless standards to choose from. And these can be implemented from the gateway and the device side using a variety of wireless IoT solutions in both module and chip form. 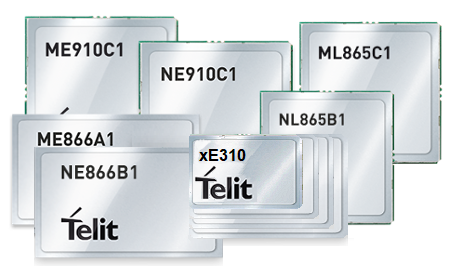 Some of these are available from the leading microcontroller vendors, but a growing number are IoT-specialist chip and module vendors. Many of today’s solutions combine multiple protocols on the same device, such as Wi-Fi and Bluetooth LE (BLE) for example. We’ll look at each of the major wireless standards appropriate to IoT, along with representative interface solutions for each. Managed by the LoRa Alliance, the LoRaWAN specification is a Low Power, Wide Area (LPWA) networking protocol designed to wirelessly connect battery operated ‘things’ to the internet in regional, national or global networks. It meets key IoT requirements such as bi-directional communication, end-to-end security, mobility and localization services. The networking architecture of LoRaWAN is deployed in a star-of-stars topology in which gateways relay messages between end devices and a central network server. Gateways are connected to the network server via standard IP connections and act as a transparent bridge, simply converting RF packets to IP packets and vice versa. The wireless communication takes advantage of the Long Range characteristics of the LoRa physical layer, allowing a single-hop link between the end-device and one or many gateways. All modes are capable of bi-directional communication, and support is included for multicast addressing groups to make efficient use of spectrum during tasks such as Firmware Over-The-Air (FOTA) upgrades or other mass distribution messages. In a recent LoRaWAN product example, Cypress Semiconductor in June announced its teaming up with Semtech on a compact, two-chip LoRaWAN-based module deployed by Onethinx. The highly-integrated Onethinx module is well-suited for smart city applications that integrate multiple sensors and are in harsh radio environments (Figure 1). 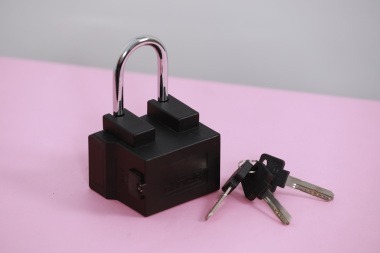 Using Cypress’ PSoC 6 MCU hardware-based Secure Element functionality and Semtech’s LoRa devices and wireless radio frequency technology (LoRa Technology), the solution enables a multi-layer security architecture that isolates trust anchors for highly protected device-to-cloud connectivity. 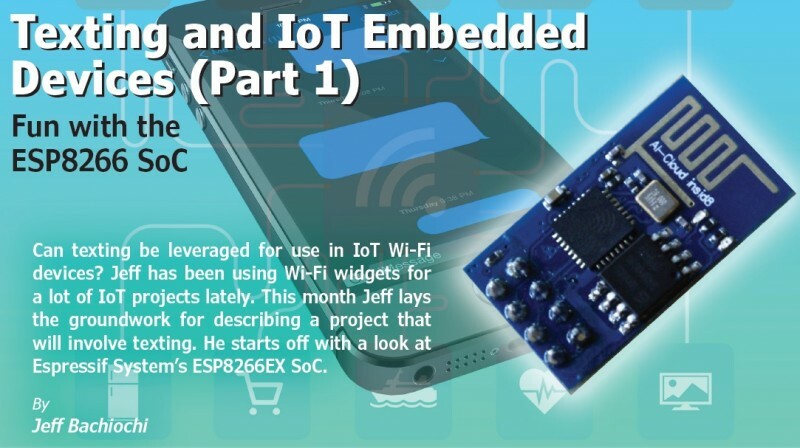 In addition, the PSoC 6 MCU’s integrated Bluetooth Low Energy (BLE) connectivity provides a simple, low-power, out-of-band control channel. Cypress claims the PSoC 6 device as the industry’s lowest power, most flexible Arm Cortex-M dual-core MCU with a power slope as low as 22-μA/MHz active power for the Cortex-M4 core. The device works well with Semtech’s latest LoRa radio chip family, which offers 50% power savings in receive mode and 20% longer range over previous-generation devices. Using Cypress’ PSoC 6 MCU hardware-based Secure Element functionality and Semtech’s LoRa devices and wireless radio frequency technology (LoRa Technology), the Onethinx module enables a multi-layer security architecture that isolates trust anchors for highly protected device-to-cloud connectivity. 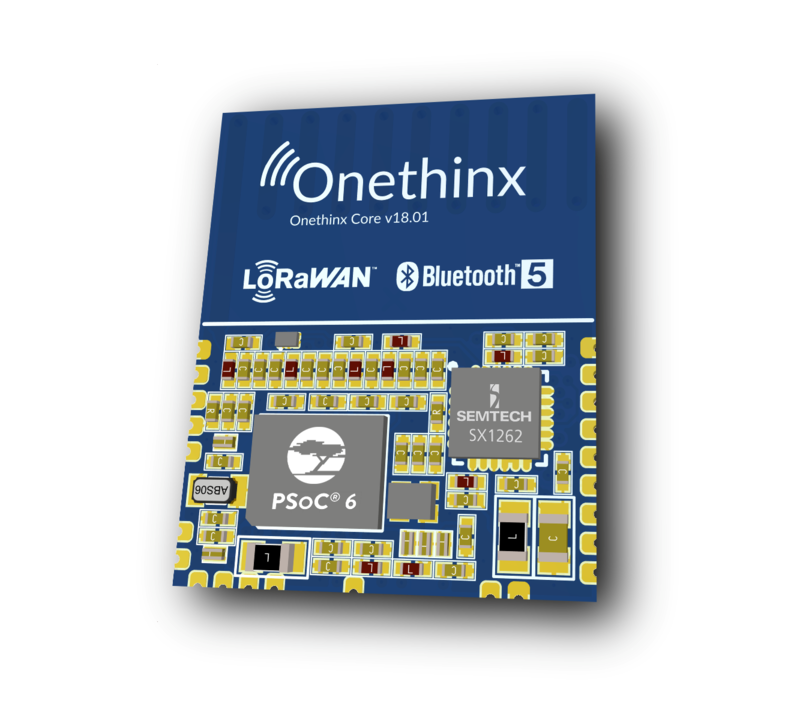 The Onethinx module uses the integrated Secure Element functionality in the PSoC 6 MCU to give each LoRaWAN-based device a secret identity to securely boot and deliver data to the cloud application. Using its mutual authentication capabilities, the PSoC 6 MCU-based, LoRa-equipped device can also receive authenticated over-the-air firmware updates. Key provisioning and management services are provided by IoT security provider and member of the Bosch group, ESCRYPT, for a complete end-to-end, secure LoRaWAN solution. The module, offered by Cypress partner Onethinx, connects to Bosch Sensortec’s Cross Domain Development Kit (XDK) for Micro-Electromechanical Systems (MEMS) sensors and to the provisioning system from ESCRYPT to securely connect. The January issue of Circuit Cellar magazine is coming soon. 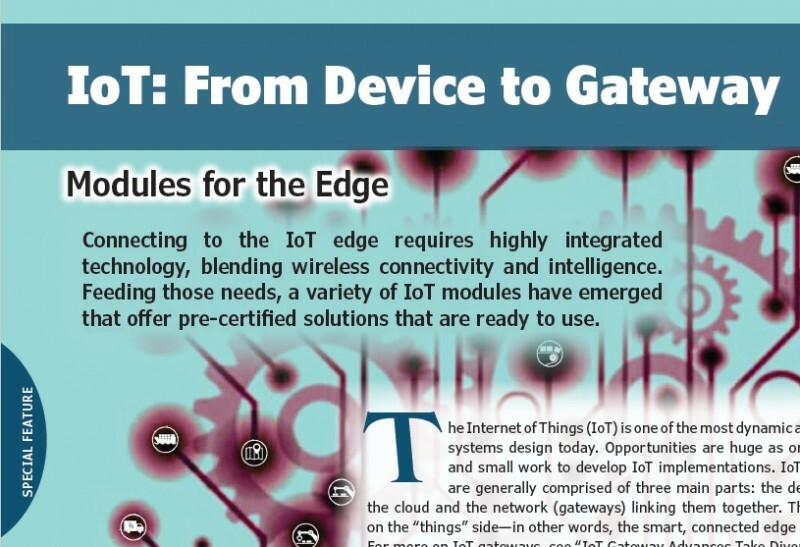 And it’s got a robust selection of embedded electronics articles for you. Here’s a sneak peak. The amount of power a commercial drone can draw on has a direct effect on how long it can stay flying as well as on what tasks it can perform. 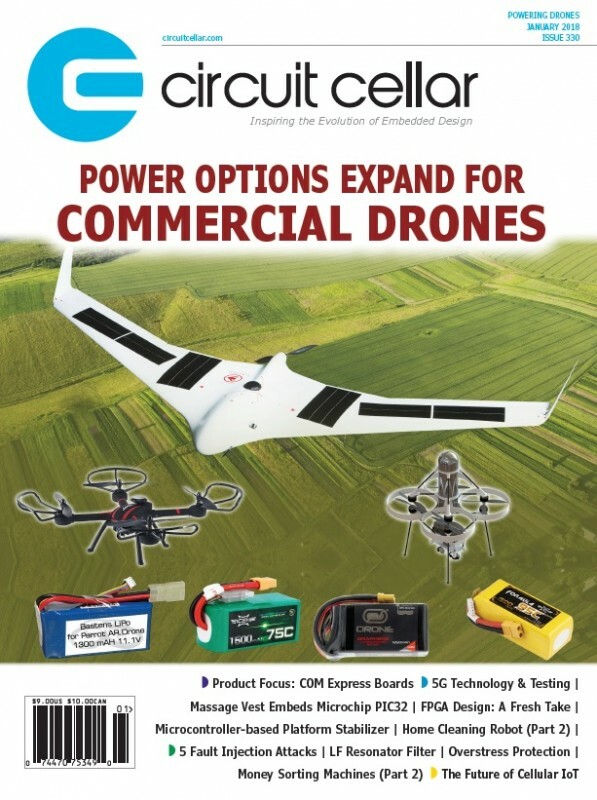 Circuit Cellar Chief Editor Jeff Child examines solar cells, fuel cells and other technology options for powering commercial drones. Although FPGAs are well established technology, many embedded systems developers—particularly those used the microcontroller realm—have never used them before. In this article, Faiz Rahman takes a fresh look a FPGAs for those new to designing them into their embedded systems. COM Express boards provide a complete computing core that can be upgraded when needed, leaving the application-specific I/O on the baseboard. This brand new Product Focus section updates readers on this technology and provides a product album of representative COM Express products. In Ed Nisley’s November column he described how an Arduino-based tester automatically measures a resonator’s frequency response to produce data defining its electrical parameters. This time he examines the resultsand explains a tester modification to measure the resonator’s response with a variable series capacitance. The technologies that are enabling 5G communications are creating new challenges for embedded system developers. 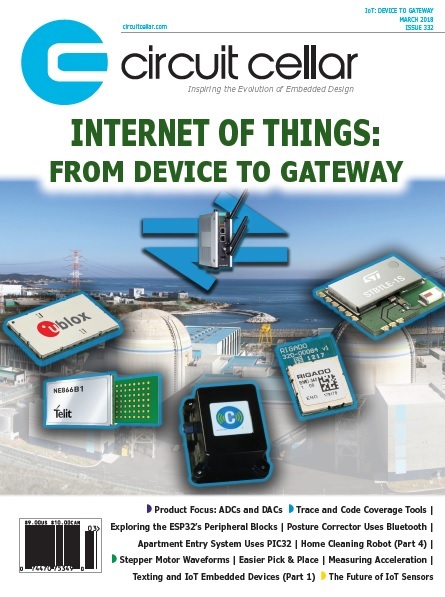 Circuit Cellar Chief Editor Jeff Child explores the latest digital and analog ICs aimed at 5G and at the test equipment designed to work with 5G technology. Using an Inertial Measurement Unit (IMU), two 180-degree rotation servos and a Microchip PCI MCU, three Cornell students implemented a microcontroller-based platform stabilizer. Learn how they used a pre-programmed sensor fusion algorithm and I2C to get the most out of their design. Continuing on with this four-part article series about building a home cleaning robot, Nishant Mittal this time discusses the mechanical aspect of the design. The robot is based on Cypress Semiconductor’s PSoC microcontroller. Microcontrollers are being used for all kinds of things these days. Learn how three Cornell graduates designed a low-cost massage vest that pairs seamlessly with a custom iOS app. Using the Microchip PIC32 for its brains, the massage vest has sixteen vibration motors that the user can control to create the best massage possible. Colin O’Flynn returns to the topic of fault injection security attacks. To kick off 2018, he summarizes information about five different fault injection attack stories from 2017—attacks you should be thinking about as an embedded designer. In part 1, Jeff Bachiochi delved into the interesting world of money sort machines and their evolution. In part 2, he discusses more details about his coin sorting project. He then looks at a typical bill validator implementation used in vending systems. Last month George Novacek reviewed the causes and results of electrical overstress (EOS). Picking up where that left off, in this article he looks at how to prevent EOS/ESD induced damage—starting with choosing properly rated components. If you’re doing any kind of wireless communications application, that probably means including an antenna in your design. The science of antennas is complex. But here Robert shows how the task of measuring an antenna’s performance is less costly and exotic than you’d think. Now that wireless communications is ubiquitous, chances are you’ll be using Bluetooth, Wi-Fi, cellular, LoRa, MiWi or other flavor of wireless interface in your next design. And that means including an antenna. Unfortunately, antenna design is not an easy topic. Even very experienced designers sometimes have had to wrestle with unexpected bad performances by their antennas. Case in point: Google “iPhone 4 antenna problem” and you will get more than 3 million web pages! In a nutshell, Apple tried to integrate a clever antenna in that model that was threaded around the phone. They didn’t anticipate that some users would put their fingers exactly where the antenna was the most sensitive to detuning. Was it a design flaw? Or a mistake by the users? It was hotly debated, but this so-called “Antennagate” probably had significant impact on Apple’s sales for a while. I already devoted an article to antenna design and impedance matching (“The Darker Side: Antenna Basics”, Circuit Cellar 211, February 2008). 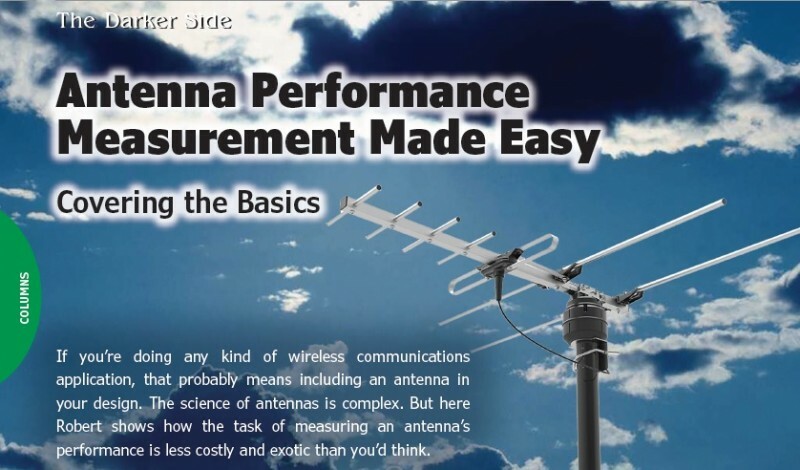 Whether you include a standard antenna or design your own, you will never be sure it is working properly until you measure its actual performance. Of course, you could simply evaluate how far the system is working. But how do you go farther if the range is not enough? How do you figure out if the problem is coming from the receiver, the transmitter, propagation conditions or the antenna itself? My personal experience has been that the antenna is very often the culprit. With that in mind, it really is mandatory to measure whether or not an antenna is behaving correctly. Take a seat. This month, I will explain how to easily measure the actual performance of an antenna. You will see that the process is quite easy and that it won’t even need costly or exotic equipment. Let’s start with some basics on antennas. First, all passive antennas have the same performance whether transmitting or receiving. For this article, I’ll consider the antenna as transmitting because that’s easier to measure. Let’s consider an antenna that we inject with a given radio frequency power Pconducted into its connector. Where will this power go? First off, impedance matching should be checked. If the impedance of the antenna is not well matched to the impedance of the power generator, then a part of the power will be reflected back to the generator. This will happen in particular when the transmit frequency is not equal to the resonant frequency of the antenna. In such a case, a part of Pconducted will be lost. That is known as mismatch losses: Pavailable= Pconducted – MismatchLosses. While that itself is a very interesting subject, I have already discussed impedance matching in detail in my February 2008 article. I also devoted another article to a closely linked topic: standing waves. Standing waves appear when there is a mismatch. The article is “The Darker Side: Let’s play with standing waves” (Circuit Cellar 271, February 2013). The Skywire is a small plug-in embedded cellular modem. It uses a standard XBee form factor and 1xRTT CDMA operating mode to help developers minimize hardware and network costs. Its U.FL port ensures antenna flexibility. The Skywire modem features a Telit CE910-DUAL wireless module and is available with bundled CDMA 1xRTT data plans from leading carriers, enabling developers to add fully compliant cellular connectivity without applying for certification. Future versions of the Skywire will support GSM and LTE. Skywire is smaller than many other embedded solutions and simple to deploy due to its bundled carrier service plans. Skywire is available with a complete development kit that includes the cellular modem, a baseboard, an antenna, a power supply, debug cables, and a cellular service plan. 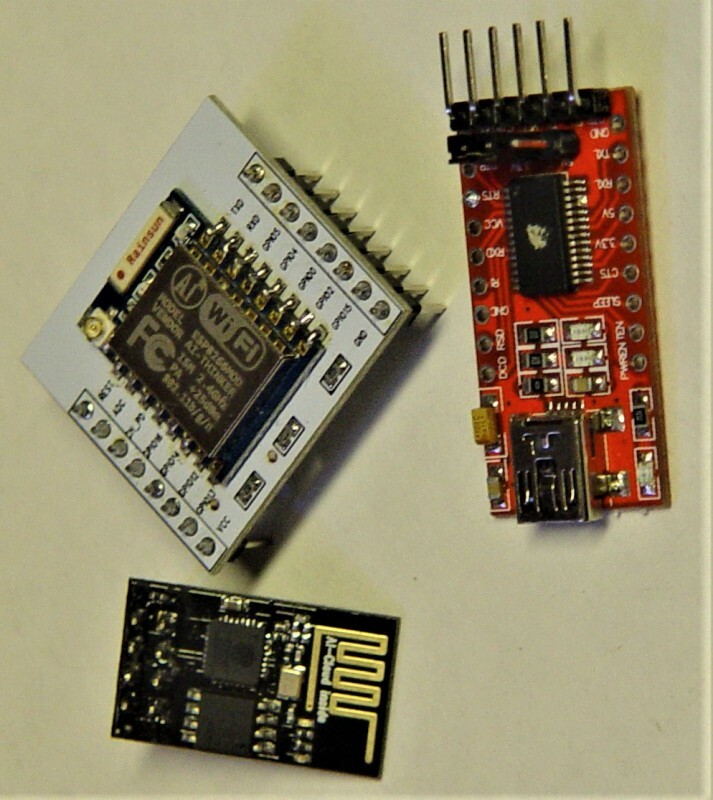 The Skywire baseboard is an Arduino shield, which enables direct connection to an Arduino microcontroller. Skywire modems cost $129 individually and $99 for 1,000-unit quantities. 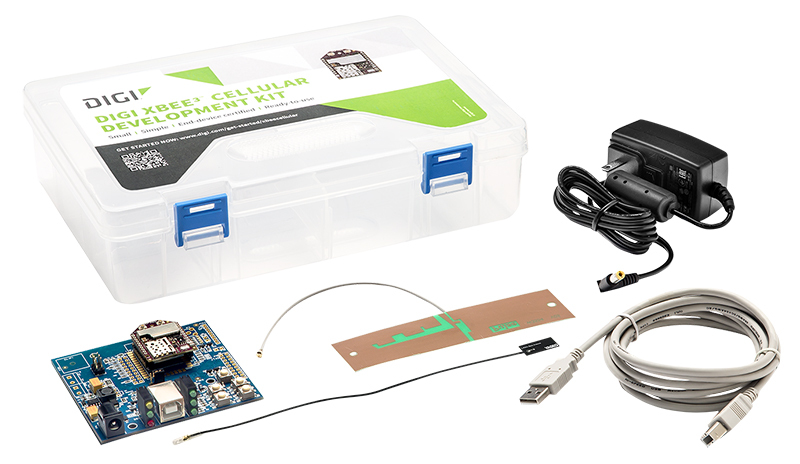 A complete development kit including the modem costs $262.